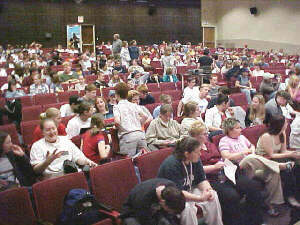 On May 17-20, 2001, the Center for Science and Environmental Outreach at Michigan Technological University, Western Upper Peninsula Science, Mathematics and Environmental Education Center, and many other agencies and organizations presented the 4th Biennial Lake Superior Youth Symposium for students and teachers (grades 8-12) in the Lake Superior watershed, and beyond. The symposium provided a unique opportunity to enhance appreciation for Lake Superior and Great Lakes watersheds, increase understanding of challenging environmental and scientific issues, promote personal involvement in creating solutions, and inspire participants to share their symposium experience with students, teachers and community members back home after the symposium. At the symposium, participants attended a wide variety of stimulating, hands-on presentations conducted by Michigan Tech University and Northland College faculty and graduate students, natural resource professionals, artists, writers, historians, and educators. More than 40 presentation topics are planned, including stream monitoring, sustainable forestry, Native American land ethic, Great Lakes shipping, fishery restoration, nature photography, and the activist's tool box. Students went on field trips to many Lake Superior environments, including: wetlands, streams, state parks, underground copper mine, and the Portage Waterway aboard a Coast Guard vessel. Students also had the option to challenge themselves on Michigan Tech's adventure ropes course and climbing wall (which mimics the challenges of protecting Lake Superior), conduct air quality investigations, and explore unique geologic sites. For fun, participants enjoyed a BBQ dinner and RendezVous at McLain State Park! The symposium also offered workshops for teachers on how to integrate Lake Superior topics into a standards-based curriculum. Workshop topics included: Leopold Education Project, Visual Environmental Literacy, Lake Effects, A Face in the Rock, and more. The symposium also offered special presentations and sharing sessions for teachers. The symposium was held at Michigan Technological University. 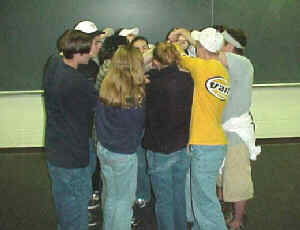 Participants' lodging and meals were provided in one of Michigan Tech's residence halls. Symposium participants were able to take advantage of the excellent laboratories, classrooms, fine arts center, and recreational facilities available on campus. 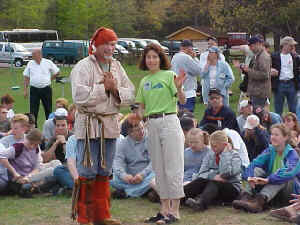 Upon their arrival at the symposium, students were assigned to a “TEAM” of twelve students. TEAM stands for 'Together We Achieve More.' In their TEAMs, students listed their local concerns for Lake Superior, drew from what they were learning at the symposium to identify solutions, and summarized their thoughts onto a poster to share with other symposium participants. TEAM recommendations will be shared with the International Joint Commission. Students will also make personal commitments to implement in their schools and communities after the symposium. Each student is asked to come to the symposium prepared to participate in one of the following activities. 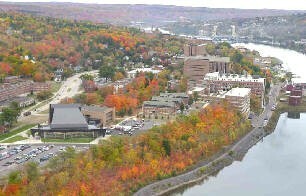 students showcase their photos, drawings, paintings or other art form related to Lake Superior. students compete on teams to share their knowledge of Lake Superior and Great Lakes watersheds; and their solutions to selected problems. students choose one of the selected topics to write and deliver a position statement on. individual, group, or class of students conduct research about Lake Superior and present a poster display. students write about their Lake Superior experiences, ideas, feelings, or imaginings.